Story Title: "Birds Of Prey"
Nova is happily flying over the city while working on his fifth delivery of the week for his new business; Nova Express. Using his helmet's telescopic lens to find the Nova Express sign in the window, Nova finishes the transaction and speeds off across town. On his way, he passes the offices of Jackson Day aka The Corruptor. Deciding to have a little fun, Nova times his speed and angle just enough to crack all of the windows with a sonic boom! As he flies away, the Human Rocket is being watched by a mysterious winged figure in the shadows. The very sight of the hero causes to stranger to be filled with rage and vows that Nova's happiness will be short-lived. Flying through his apartment's skylight, Nova is surprised to find his ex-girlfriend, Laura Dunham, waiting for him. Rich's roommate, Bernie Dillon, had let Laura in so her and Rich could discuss their relationship. In the shadows, the angry stranger is watching their every move and he remembers when he had been happy. In his reflections, the winged man is revealed to be The Condor! Meanwhile, Rich and Laura are eating at a local pizza parlor discussing their feelings for each other. Rich tells Laura that since the Tailhook incident, he has developed feelings for one of his New Warriors teammates, Kymaera (formerly Namorita). After a long discussion, they decide to slowly give their relationship another chance. After a half an hour of talking, Rich and Laura are leaving the restaurant when they are attacked! Rich is hit from behind by a speeding figure who grabs Laura and lifts her into the sky! Rich quickly changes to Nova and flies after their attacker. He is shocked to discover that his old foe, the Condor, was behind the attack! With Laura being held hostage, Nova tries to rationally talk to the Condor and convince him that what he is doing is wrong. The Condor refuses to listen and hurtles Laura off of a building. Nova catches her and takes her to safety. 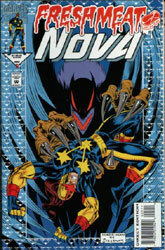 With Laura safe, Nova flies up to the Condor and knocks him to the street with a powerful punch. As the two continue to battle, Nova still tries to convince his foe to give up his attack. However, the Condor fights on. He's convinced life has treated him unfairly and everyone around him must suffer. As the two battle, they become entangled in electrical wires which snap and fall towards the rooftops. The wires accidentally hit Laura and she is knocked unconscious. The two combatants rush to her aid and find she is no longer breathing. Nova and the Condor begin giving Laura CPR in order to restart her heart. After Laura is revived, the former foes thank each other. Condor for helping save Laura and Nova for helping Condor find his humanity. Meanwhile, a mutual foe of the Condor and Nova has been watching their battle. The Sphinx has come to the conclusion that Nova is far more of a threat to him than ever before. In order for his plans to succeed, Nova and the New Warriors must be eliminated!